Kalimudah is a canyon for everyone, Kalimudah combines all techniques of canyoning into a short and fun trip for all levels of experience and fitness. If you want an introductory course, this is it! You can expect jumps, rappels & slides, and guaranteed entertainment for family and friends. The ability to swim is desired but not a requirement. After a 10min drive with a pickup and 10min walking down in Bali jungle to reach the start point of Kalimudah canyon. Approximately 2.5 hrs canyon with 7 rappels up to 15m, 4 jumps (Optional) up to 8m, 2 slides (optional) up to 4 m, swim up to 20m. You will reach the end point of the canyon with 15m rappel and take a rest in a natural hot spring. To return to your transfer, you will enjoy another 10min hiking to reach the pickup and back to the base camp. 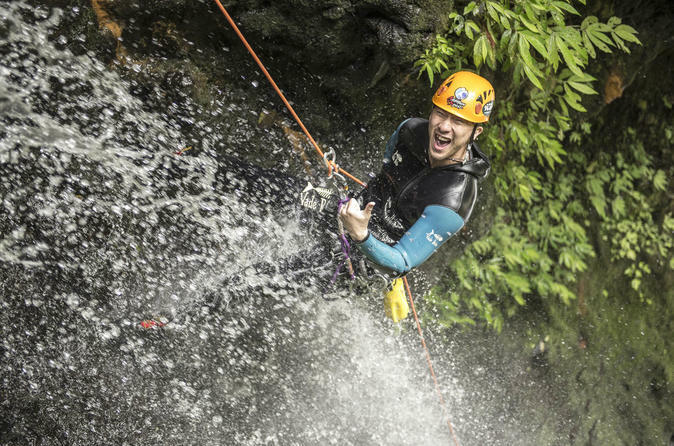 Shower, lunch, and you will receive your ICOpro (International Canyoning Organization for Professionals) Canyoneer initiation certificate (ICOpro card) and your photo for free (Bring with you an USB flash disk or external hard drive). Sit back and relax in our air-con transfer back to your hotel.